How to celebrate 65 years! A birthday is a special occasion because it marks your arrival into the world and your continued place in it. It is the way you can pause and assess how you are doing. Although there are millions of people celebrating the same day, it is very special so I’m sharing how to celebrate 65 years in a series of posts. For me, my 65th was quite a milestone. It is the ‘move to another box’ birthday. You know when you have to fill out your age on forms, 65 is another box and usually the last because it says 65+! Anyway, enough of this maudlin talk! 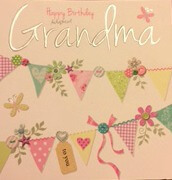 What a birthday is full of is cards, cake and love! 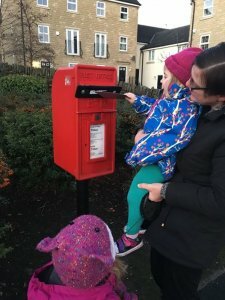 Posting Julia’s birthday card through the snail guard on the post box. It stops the snails eating the post, they like the glue apparently! I was thrilled and let her know that it had made me cry! Do you blame me? 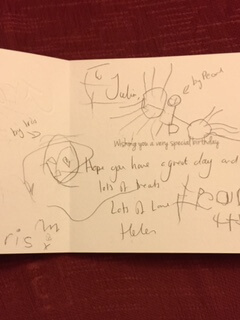 Well, we were away for my birthday so it was lovely to return to this gorgeous card, specially altered for my unusual status. Inside, as befits the ‘daughters’ of the founder of 100 Word Challenge a weekly writing project for young people, you can see that both Pearl and Iris are going to be authors soon! There’s even a portrait of me! So there you have it! Card and love. All that is missing is the cake and that was provided by the owner of Alimo, a Moroccan restaurant in Whitstable. 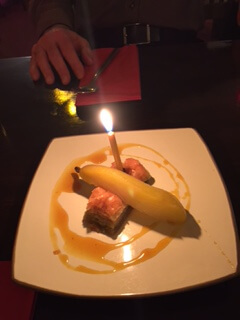 It consists of a slice of baklava and pear and of course a candle. Now that is how to celebrate 65 years! Greetings! Great post as always – really enjoy reading up on your retirement adventures and lifestyle. I was wondering if you ever considered Housesitting as a means for income. It is a low-maintenance job and has the benefit of free accommodation. Housesitters have the chance to earn some money on the side while still having time to work and relax – on the job! It truly is the ideal job for seniors – keeps you busy but not too much. I recommend visiting a website like Housesitter.com to view opportunities for you! How interesting. Not heard of it but thanks for giving me the links! Enjoy that time as it rushes by! That is how to celebrate 65 years! So elegantly!!! (that dessert) And with such love!!! They seem to be becoming quite a regular event Tess!